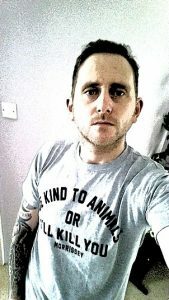 Anyone who read Birkenhead-born Nathan O’Hagan’s excoriating debut novel The World is (Not) a Cold Dead Place, published in 2015 by Leeds-based punk publishers Armley Press, almost certainly wondered what this talented author was capable of next. That first book, a gutsy story of a serious social misfit forced to work in a call centre, attracted immediate media attention, becoming a talking point on Johnny Vaughan’s radio show and being pegged by online magazine Sabotage Times as ‘The Cult Book of the Year’. Well, the wait will soon be over as we approach the publication of Nathan’s second novel, Out of the City, and if his first book came from a cold dead place, then this one dials it down to absolute zero in a gripping thriller full of murderous obsession and violent retribution. 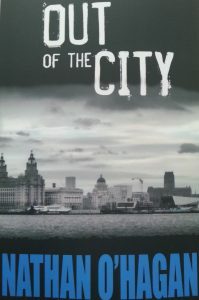 The story, set in contemporary Liverpool, concerns three principal male characters – Christian McGann, a narcissistic young skateboarder exploring his own ambivalent sexuality; Scott Collins, a steroid-addicted bodybuilder troubled by strange new feelings and dark fantasies; and Nick Hanman, a failing family man bullied by his abusive father, manipulated by his powerful boss and compromised by his shady profession as a fixer of other people’s problems – and how their lives interact as each of them faces his own ‘crisis of masculinity’. Moving through the bars, gyms, housing estates, retirement homes, gay clubs and footballers’ Cheshire mansions of a place the author knows well, Out of the City explores a world of suffocating guilt and psychosexual violence. O’Hagan is not a writer to look away from difficult subjects, dragging dark areas of the male psyche into the light. In doing so, he produces something that transcends the crime genre, and which is comparable to the works of, say, Bret Easton Ellis or Hubert Selby Jr.
Out of the City will be published on 17 February but can be pre-ordered from Amazon here. It will be launched by the author at Blackburne House Bistro in Liverpool on 18 February at 7:30 pm. For more information and entertainment, visit www.armleypress.com.